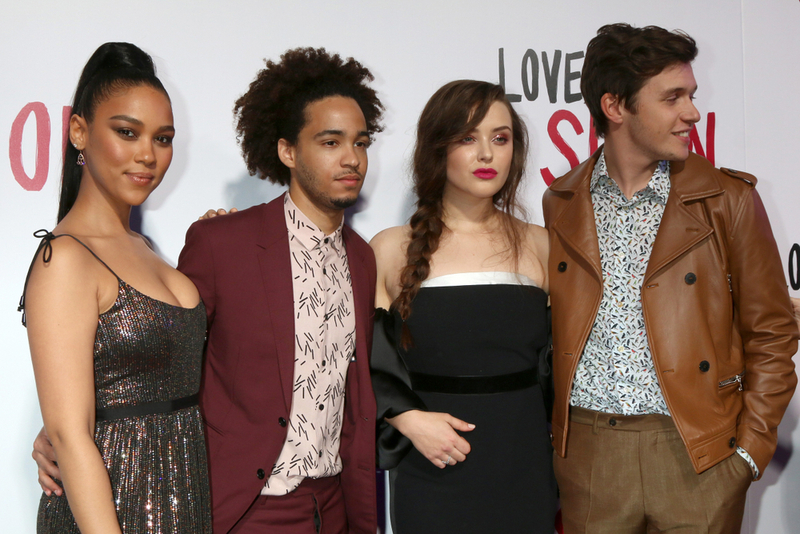 The cast of “Love, Simon” at the Century City Mall Atrium on March 13, 2018 in Century City, CA. The last decade has seen a growing number of movies about gay teenagers. While it’s still not enough to call it representation, at least films like Moonlight, Blue is the Warmest Color, and Call Me by Your Name have made headlines and won awards. There’s just one problem: all of these are morose dramas, and none are for teenagers. Call Me by Your Name is particularly unhealthy for a gay teenager to watch, as the plot revolves around a teenager learning of his sexuality through being groomed by an adult. Love, Simon is a bro-movie romance based on the atmosphere of the Archie comics. It plays with the trope of jocks bullying the gay kid, but pulls its teeth because Simon is a jock himself and remains popular both on his team and with his drama class comrades as he comes out and seeks love. But Time magazine makes a good point about the movie, which came out on March 16th, 2018. LGBT kids who might identify with Simon (those with solid support, accepting families, and wealth) aren’t the ones who need an affirming movie. “[Love, Simon’s] vision of how good it feels for a masculine, traditionally attractive bro to receive encouragement might not resonate at all,” wrote Daniel D’Addario in his review. Much like the recent reboot of Will and Grace on TV, this feels like a step too late. Perhaps this movie was meant to come out in 2014. Not to say that all of the troubles facing LGBT teens have been left behind, but Love, Simon seems to be selling a future that’s already happened. If it has an audience, it will be those LGBT adults who would have died to see a movie like this when they were teenagers, when they never thought they would be able to find happiness or family. And the movie makes it quite clear it is not about them, either.